Blue Note record covers showcase the wonderful graphic elements of photography, design and typography brought together by Reid Miles. The array of fonts Miles selected changed from title to title, and nice examples are given by the “Fonts in Use” site – Bodoni, Clarendon, Franklin Gothic, Aurora, lots out there. One graphic designer online declared “Franklin Gothic” is THE Blue Note font. Well, no, it isn’t, just one in use. Hold on tight, this could get bumpy! Put to one side the genius of Miles Reid, his typography use was designer fonts, not day to day business. Matters more mundane demand out attention, the printing of plain text and information that signposts sources and dates of manufacture, and a lot of trivia on the way. Hoffman Forum frequenter William Brown (W.B.) of New York and Saturn, knows his fonts, and has thrown more light on the printing and pressing of Liberty, which accelerated under Transamerica ownership (mainly 1969-70) into a more complex beast than I imagined. 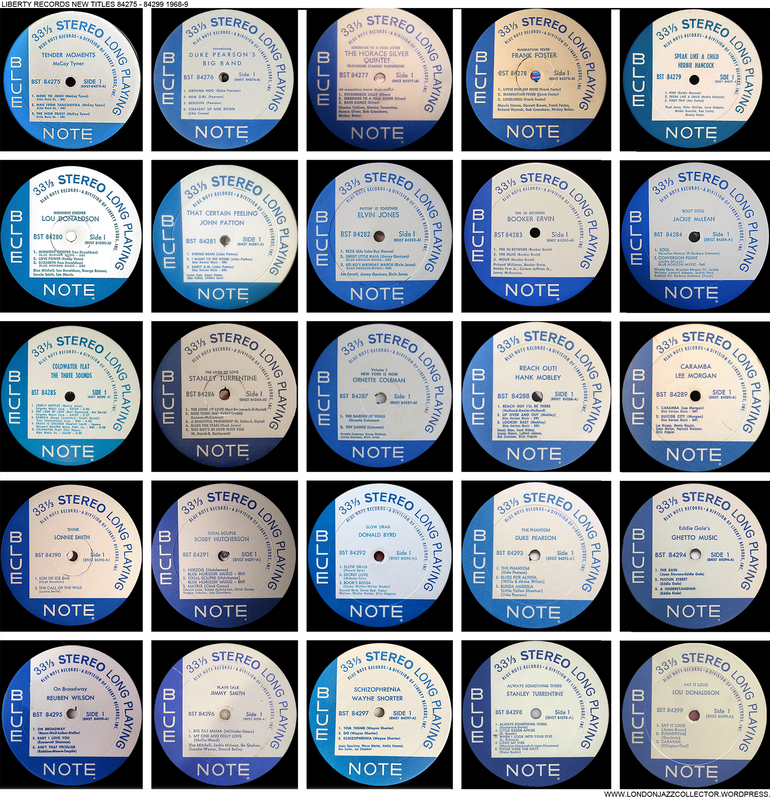 Follow me down the rabbit hole to Part III of the Guide to Blue Note Liberty Years. I thought we had gone deep, but realise we had only scratched the surface until now. Check your survival rations, we are going seriously down deep, into the unknown. To recap and expand, in printing and typography, hot metal typesetting is a technology for setting text in letterpress printing. The process injects molten metal alloy into a “slug” of set text, made up of characters and spacing, to form a relief printing surface ready for inking in letterpress printing. Eventually hot metal was replaced with more modern technology, but through the ’50/’60s it was how they printed text – meaning record labels and jacket slicks. And irritating advertisements. The technology revolved around the chosen manufacturer of typesetting machines such as Linotype (Mergenthaler Linotype), Intertype, Monotype, Ludlow and others. A Linotype-style machine literally produced “lines of type” in a process called line-casting, which assembles lines of metal text. Linotype and its main competitor Intertype was favoured by the newsprint industry (and our record companies) , while Monotype used a different setting method, composing type of individual characters, which was slower but more flexible in the use of non-standard characters such as algebra formulas. Type Foundries manufactured the metal typefaces used in linecasting machines, supplying magazines of individual metal characters in various font designs and point-sizes. 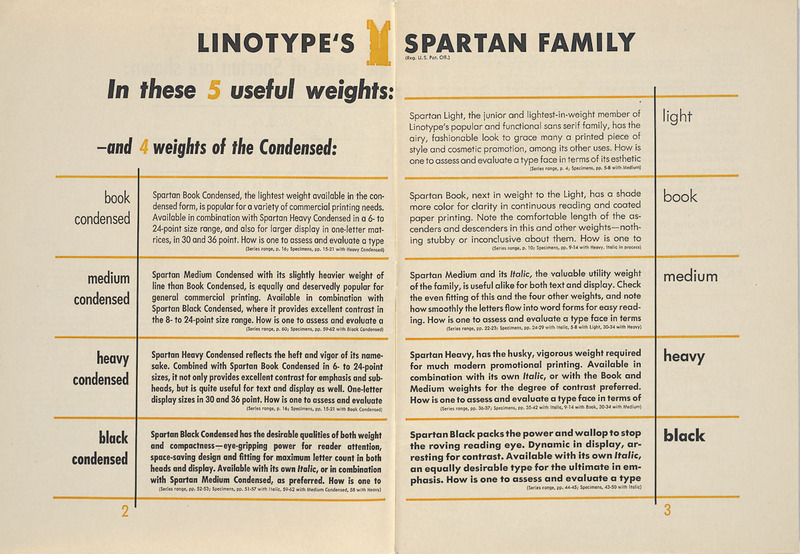 Any given design of font, such as Linotype’s Spartan, was available in many point sizes, variations in weight (light, medium, heavy and black) and emphasis, such as italic and condensed (squashed up). The dominant players in linecasting machines were Linotype, and Intertype, which was founded by former Linotype employees who took advantage of the expiry of Linotype patents to develop a rival typesetting machine. Linotype was used by Bert-Co and Columbia Pitman, and rival Intertype was used by Keystone, who printed original Blue Note labels. Machine-centric technology determined their choice of typefaces. Typefaces separate broadly into those with serifs, with top and tail, and without serifs “sans serif”, considered more modern. The modernist typography movement was spearheaded by sans-serif geometric fonts, whose leaders were Futura and Erbar, released in the late twenties. Though there are hundreds of thousands of competing fonts from hopeful designers, a few iconic fonts tell the real story of vintage print in the 50’s and ’60s. 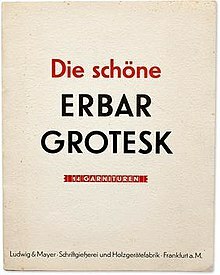 Jacob Erbar designed one of the first geometric sans-serif face, Erbar-Grotesk in 1926, cast by the Ludwig & Mayer foundry of Frankfurt, Germany, with machine composition matrices later being offered by American Linotype. However the industry leading sans serif typeface, still widely used today, emerged as Futura, a geometric sans-serif typeface designed by Paul Renner and released a year later than Erbar, in 1927. 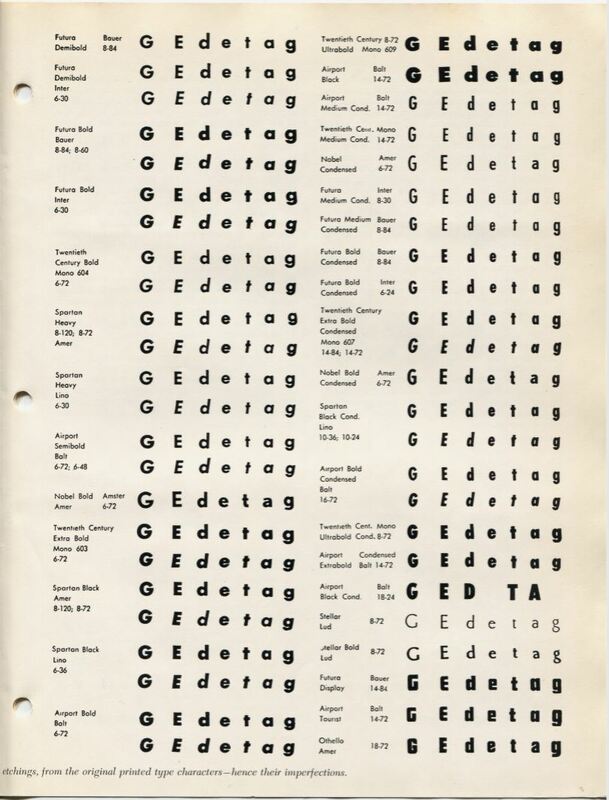 It was developed by the German type foundry Bauer, to compete with Ludwig & Mayer’s Erbar. Over the years, these classic fonts have grown huge families of variations, and many near-copy competitors which make the whole font-scene perplexing to the outsider, i.e. normal people. However Sherpa LJC is your guide, have no fear, trust me. Just not with your rations. Futura favoured simple geometric forms: near-perfect circles, triangles and squares, capturing the spirit of modernity, using the slogan (in English) “the typeface of today and tomorrow”. It still looks “modern” after eighty years in use. 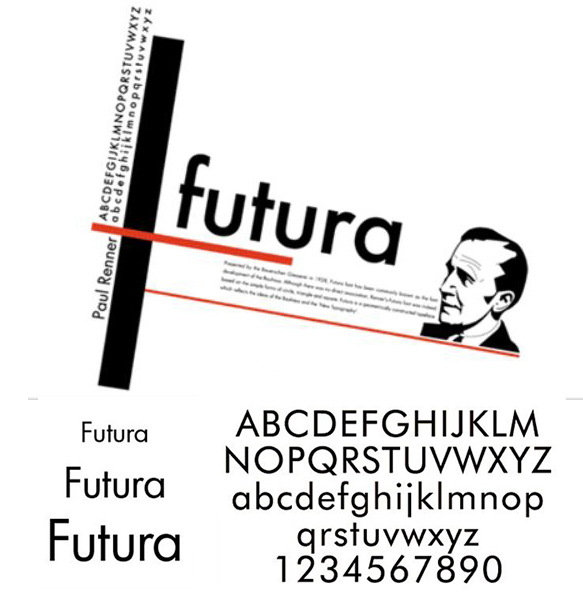 Futura was immediately successful, with its commercially appealing combination of classicism and modernity. 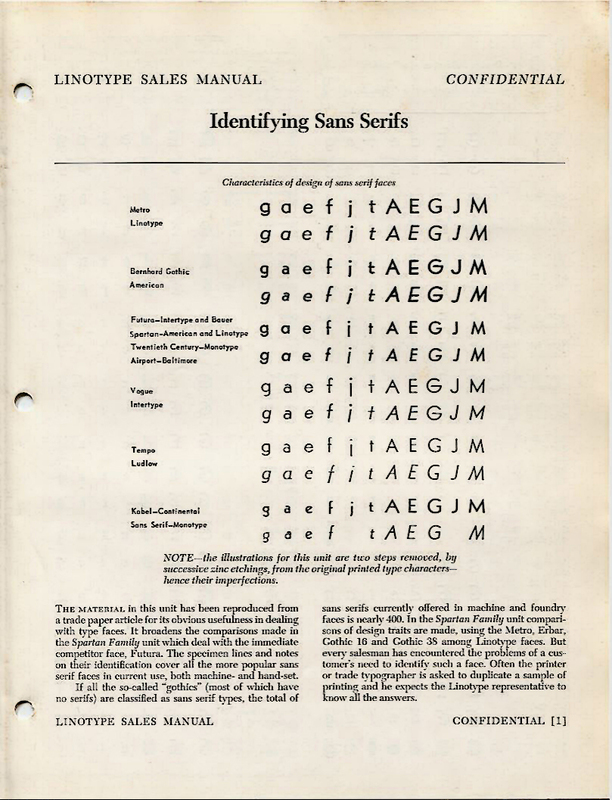 It spawned a range of derivative geometric sans-serif typefaces from competing foundries in the United States, including Spartan by Linotype, Vogue by Intertype, Twentieth Century by Monotype and Tempo by Ludlow, many of which are near identical copies. There are thousands of fonts, but this particular Intertype font is unusually important. Intertype was the line-casting machine used at Keystone, who printed the labels for Blue Note, and later for Liberty. The character display below is taken from a typophile site interested in the vintage fonts of the ’50s and ’60s, an interest of which I thoroughly approve. We will come back to it. 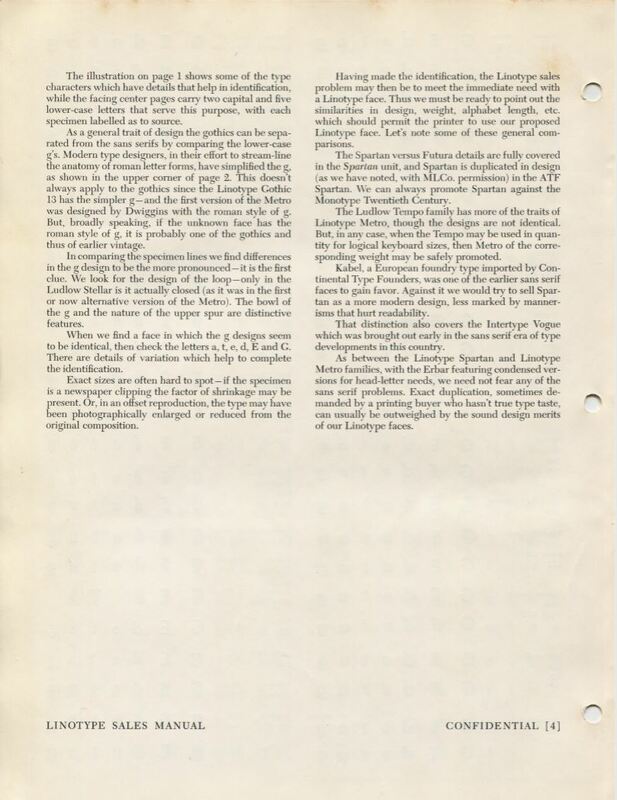 The Linotype Sales Manual gives an insight into how fonts were pitted against competing machines, fonts and foundries, for example, Intertype’s Futura, compared with Linotype’s equivalent, Spartan. Sharp drop down the rabbit hole, if not free fall. It’s marked Confidential, so I’m going to have to leak it. OK, you now have the job selling Linotype typefaces Weekend homework – memorise the sales spiel. You start Monday, and I expect results. Just to improve your typographic vocabulary, here is another Foundry, ATF, and their various font families, by weight and extension. The fascinating thing about print is the subliminal communication that form and emphasis attach simultaneously to the meaning text. People get told off for “shouting” on the internet for typing all capitals, ridiculous maybe, but the rules of grammar dictate when capitals should be used – in Proper Names and opening sentences – not all the time for emphasis. The print media understand all too well how to “manage” these effects: the short attention-getting shock headline, the caption, the quote snippet, the sub-heading in heavier weight, I do it myself using regular font and italic to choreograph an imaginary conversation. 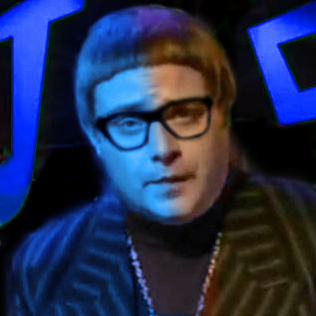 So you say, LJC. Informational text also has a different hurdle to jump: legibility/ readability. The font-set which has the best readability is one in which the eye quickly registers every character as uniquely different from every other character, which is why modern fonts like Ariel and Courier are so effective. Decoration and eccentric design elements in a font render it less readable, slowing the brain down to decipher them. The geometric sans serif fonts were so ubiquitous because they did such a great job in being both readable and modern. The most notable difference with these fonts at a glance is the number 1 – horizontal serif, diagonal serif, or no serif. The font identifies the printer which in turn identifies the likely pressing plant. Record companies, like every other business, needed competitively-priced local printing services, and no printer could afford an infinite range of fonts in all point sizes and weights. Printers stocked only a limited range of font magazines sufficient to meet their client’s needs, which left behind a clue to their identity. Fingerprints. As WB helpfully pointed out, west coast Bert-Co were a Linotype printing-house, and the Bert-Co font-library stocked among other things, a particular font, probably Spartan, only in capital letters for that point size , hence their typesetting reflected their font-library: SIDE 1 not Side I, not because some compositor favoured capitals, but because that is the only font variation of that typeface they stocked. 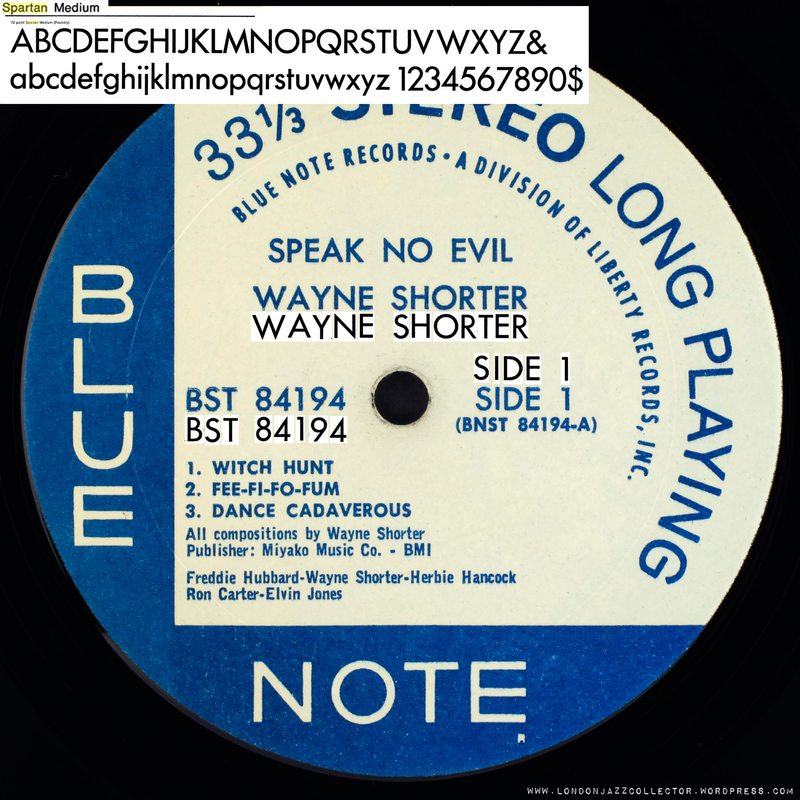 Its blindingly obvious now why Bert-Co labels for Blue Note reissues for a time all had SIDE in caps and 1 with a serif. The Blinding Obvious is generally unearthed only by painstaking groundwork in the dark. 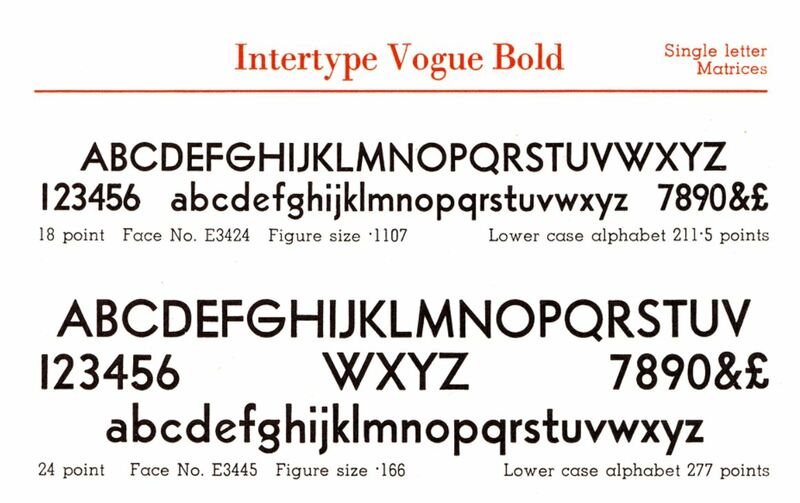 If we go back to Liberty/Keystone/Intertype/All-Disc operation on the east coast, it is timely to revisit the Intertype competitor to the Futura sans-serif geometric font, Vogue. 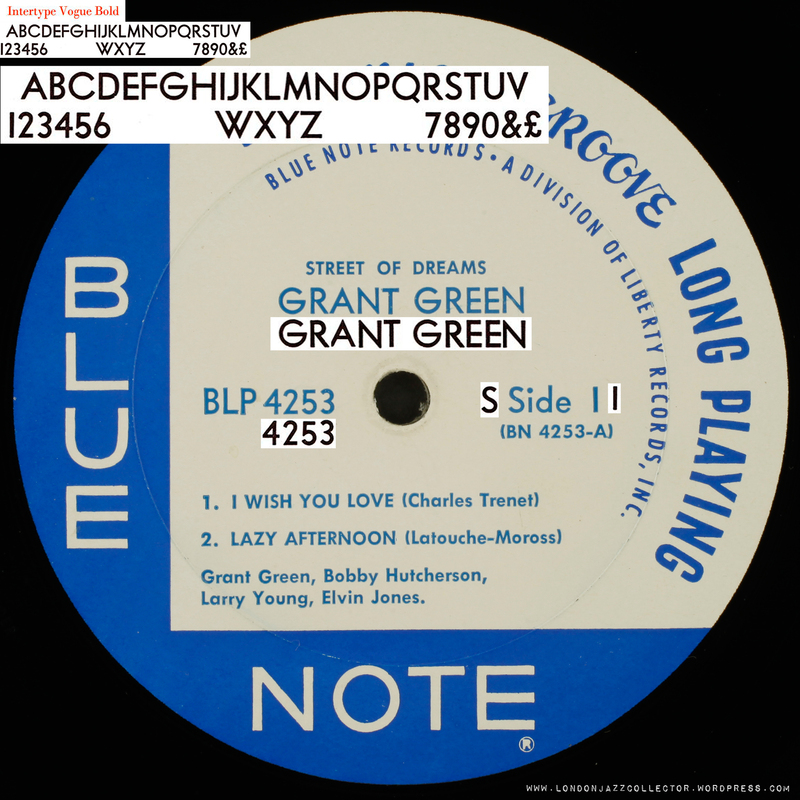 A little experiment courtesy of Photoshop to mimic line-casting, and see how well it matches the type on a known Van Gelder/ Keystone Blue Note Liberty label, Grant Green Street of Dreams. Point-sizes are only approximate, the crucial match is the exact shape of each letter. It’s a wrap. Keystone set Blue Note Division of Liberty artist and album title, and catalogue number on this 1968 mono issue, in Intertype Vogue Bold. Game set and match. UPDATE: While on a roll, how about that Bert-Co Linotype font with the SIDE 1 serif? The Linotype geometric sans-serif font family is Spartan. I found a Spartan Medium, a Spartan Heavy is too heay, but it’s the shape of the letters rather than the weight. Same trick – overlay the fonts on a Bert-Co label reissue sans-Van Gelder. It’s a match. All letters and numbers have the same shape as Linotype Sparton, probably should be a tad heavier weight, perhaps the ink spreads a bit more on paper. It’s a good a match, especially the horizontal serif on the 1 and the large-body 4. Bert-Co/ Linotype Sparton Medium. The small upper and lower case artist and composer credits are in a different font altogether, compare the descender of letter “y”, confirming Bert-Co maybe stocked just capitals in Sparton Medium. Under Transamerica ownership mainly in 1969/70, Liberty expanded the number of plants and their respective print-houses, from the initial 1966 All Disc/ Research Craft configuration, to others including Tennessee and we now discover from WB, Columbia plants. Columbia apparently used Linotype Erbar fonts at Pitman and possibly its predecessor Bridgeport?. 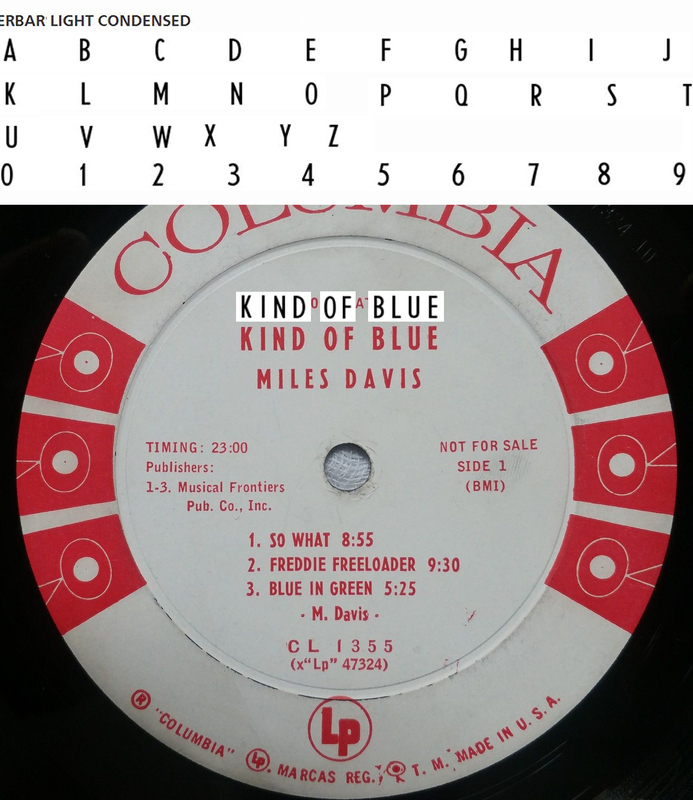 To test how well this works in practice, here is Kind of Blue Promo (1959) matched against Erbar Light Condensed. The weight is slightly off, perhaps Bold would make a better match, but it is definitely the Linotype Erbar family of fonts. At this stage in the Liberty Years, just about everyone has their fingers in the pie. Lou Donaldson’s Aligator Bogaloo turns up at least five disguises, the first three the usual suspects, number four is a dark horse, Columbia Santa Maria (hat-tip to WB)and the final is Columbia Pitman. A trawl through Discogs uploads of new Liberty titles from 84275 to 84300 found very many obviously Bert-Co labels, slightly fewer Keystone labels, and just a few Erbar font/ Columbia pressings on only a few titles. By now, everybody presses and prints Liberty, you see below the bewildering variety of printer’s fingerprints in font choice and character spacing aligned with four or five pressing plants. The good thing is that unlike the reissues programme, new titles are mostly, though not always, all Van Gelder. At the 1968/9 Transamerica crossover, most new titles are Van Gelder (at least where he was the recording and mastering engineer), whichever the print-house/ pressing plant. However pressings still turn up without Van Gelder where a Van Gelder exists on other pressings, for some reason, often Wayne Shorter albums. Though this genre is not my taste today, it was certainly many peoples taste in the late ’60s, and still has many fans today, so good on them. There is more to be done to bring typography and line-casting into the mainstream, but bite-sized pieces are my current approach. Google searches merely serve back what I have already written, nothing much seems out there.There are still many more branches off this particular rabbit hole, who knows where they might lead? I certainly don’t know, yet. It’s all a journey of discovery. I can’t wait for the next episode, still to be written. 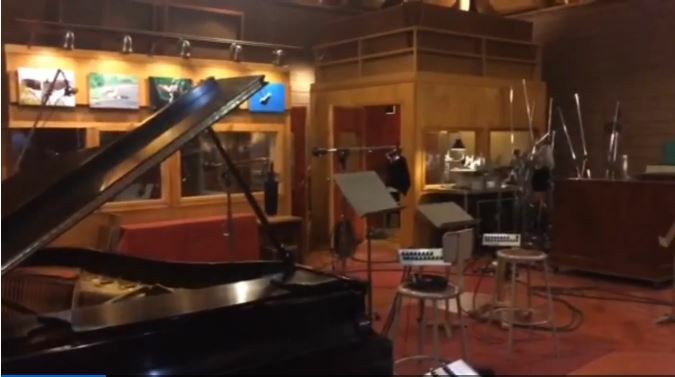 As an aside, Mosiac Records just posted a New Jersey link of an all-too-brief Bob and Maureen Sickler video on Van Gelder’s Englewood Cliffs studio. For just a few minutes, I felt at home. You must watch, it’s well worth all three minutes of your life. This entry was posted in Blue Note, Liberty and tagged Bert-Co Hollywood CA, Blue Note, Erbar, Futura, Intertype, Intertype Vogue, Keystone, label fonts, Liberty, Linotype, Spartan by LondonJazzCollector. Bookmark the permalink. The fourth, “unknown” typesetting on Lou Donaldson’s “Alligator Bogaloo” album was from Columbia Santa Maria. That plant was heavy on Varityper fonts, notably 7 point Sans Serif Bold for matrix number and song selections; 10 point Sans Serif Bold Condensed for album title; and 12 point Gothic No. 13 for artist name, catalogue and side numbers (replaced, after February-March 1968, by a similar-looking typeface known as Gothic Extra Bold Condensed which had numerous differences in capital letters C and S and number 1). Updated for Santa Maria, hat tip to you, sir. “Varityper”?, hmm, more homework required. FYI- This post was picked up by Mosaic Records for inclusion in their “Sunday Jazz Gazette” email newsletter. Expect more traffic to the site. Great article BTW ! Thank you so much for your research, scholarship and writing to document typology for Blue Note and other jazz labels. This area has been an intense focus of mine, given my hobby. I enjoy making “mini-LP CDRs” of my jazz albums, for convenience in listening while driving, particularly on long road trips. Over time, I’ve invested significant energy and resources into making the best dubs possible (96/24 on a modified Tascam DV-RA1000HD recorder), even acquiring a large flatbed scanner to replicate the cover art well in Photoshop. These are printed on Epson R340 Photo Stylus printer, on either Taiyo Yuden Watershield or Disc Makers Ultra Hydroshield CDRs. The cover, assembled in Photoshop with a title spine, once trimmed, are wrapped and spray glued on 5″x5″ paperboard CD cover sleeves. I even use an inner sleeve. As you have noted in your articles, I’ve observed the differences in blue color tone, the differences between Keystone and Bert-Co printed options for Liberty pressings, and the different font types. While I have elected to not be a purist, I’ve investigated different san serif font types on numerous websites, looking for a suitable replacement, if necessary. Getting BLUE NOTE right, has been a challenge, as you discuss. In fact, I use several fonts to get what I have, and even then, I needed to extend the lower part of ‘L’ to get it near right. The mono ‘MICROGROOVE’ has been a particular quest. I even reached out to Ron Rambach of Music Matters about it, and he told me its likely a hand drawn script that they scanned for their version of the Blue Note label. I scanned the best example I had then worked in Photoshop on getting the color matched. At this point, I have replicated hundreds of Blue Note records into mini-LPs, and many more from other labels. Your work has helped me immensely. My quest to get more typology right continues. Thank you! 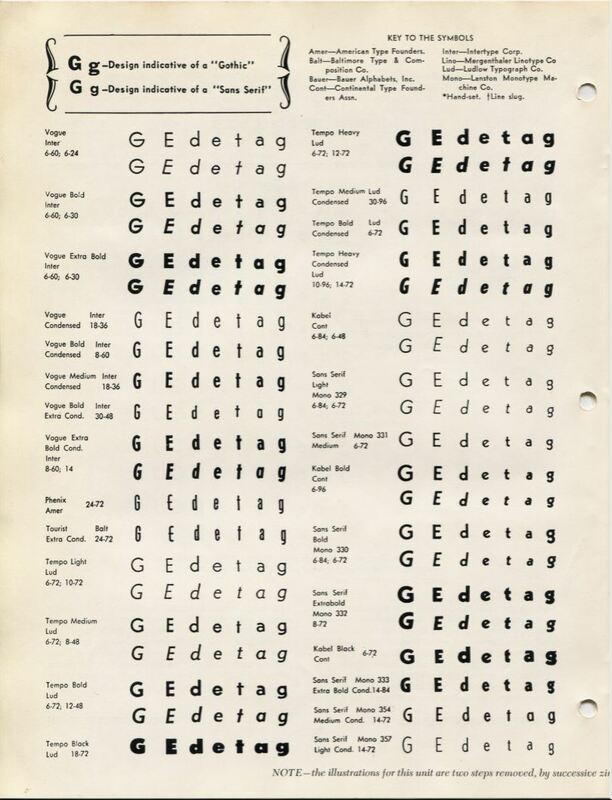 Fascinating insight to record label typography. I had no idea there was so much detail. My main interest is in the cover designers and I had not realised there was such a wealth of variation in label design & typography. I imagine most record companies didn’t save mechanicals because they took up needed storage space, and they didn’t envision a future need. That is true for IAJRC LPs: No cover mechanicals exist for any of the 52 LP covers. Small labels, such as Blue Note, printed early covers in two-color because of the cost of four-color. 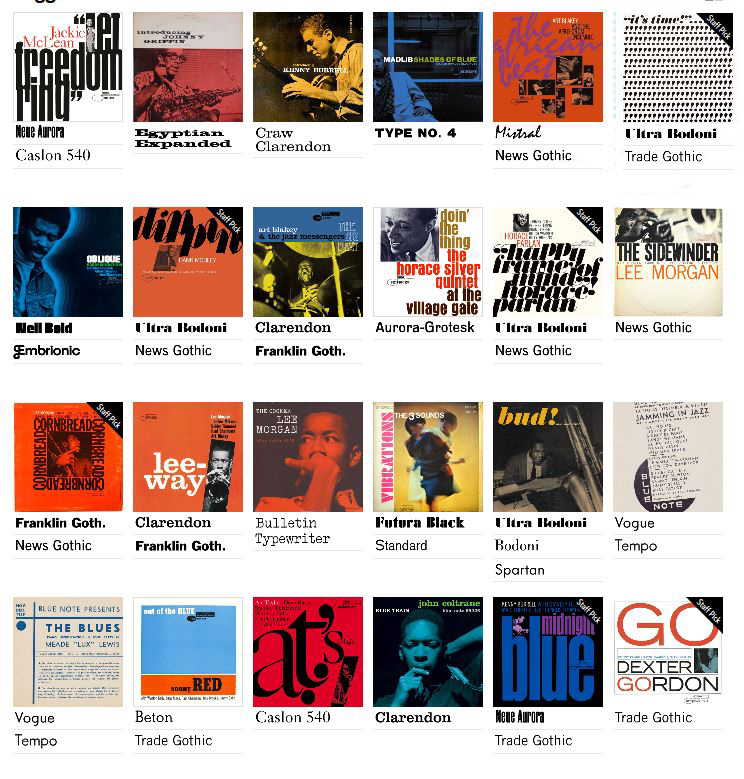 I discussed this with Paul Bacon, who designed many of the 10-inch Blue Note LP covers. Prestige was even thriftier, printing early covers in black and white. We never saved any of the cover mechanicals on the magazines I worked for. I designed a number of LP covers for Music Matters Blue Note series. I’d just like to say this is a great series on a great blog and kudos to you for digging in and putting together such a thoughtful and well structured piece. The ‘bread and butter’ typographical elements of a label like Blue Note are fascinating.What becomes apparent in your descriptions are the nuts and bolts of design and the influence of the ‘hand’ as different typesetters at different printers do their stuff. Studying original issue BNs one becomes aware of Reid’s methodology, especially his love of the hi-contrast bromide print and scalpel. He shot, chopped and cropped then stuck with glue (I’m guessing Cow gum or US equivalent) and despite what the finished articles looked like Reid’s use of display type was often expressionistic in construction. Along with my growing interest in jazz beginning when I was about age 3 (circa 1939), I had a growing fascination with printing and type. In grade school, I took printing shop using handset type, progressed to buying so-called “toy” printing presses on which I produced my own newspaper. This required hand-setting the type and creating flexible rubber block-mounted illustrations. In junior high, I took two back-to-back semesters of printing shop during which I was the only student. I became quite adept at hand-setting type in different fonts and point sizes. I had the layouts of different type cases etched in mind, I knew automatically what to reach for and my hand would go by rote to the right letter. I could also tie a surgeon’s knot with one hand to secure type in a stainless-steel composing stick (I still have one). After college, I went to New York and worked for The New York Mirror, a daily morning Hearst tabloid paper. Because of my experience with type and printing, I worked in the large second-floor typesetting, makeup, and stereotype room. Between editions, I would sometimes watch the operators at the Mergenthaller Linotype machines to learn the process. Several times one of the operators let me sit at the keyboard and attempt to type-set copy. The keyboard required a light, flat-fingered touch, otherwise the matrices for a given letter would shoot down sometimes emptying the case of that letter. My job was to supervise page makeup. I stood on one side of the “stone” and carefully made sure the makeup man followed the rough hand-scribbled layout on a single sheet of paper as he laid type into a steel form. To do this work, I had to learn to read type backwards and in reverse. I later progressed to using a photo type-setting machine to produce film strips on white paper for magazine-page makeup. I not only wrote the text but set the type. Learning to walk and chew gum prepared me for this job. I got to know Paul Bacon who designed album covers for Blue Note, Riverside, and Universal. He later designed hundreds of dust jackets for book publishers, including some of the most famous ever produced. He frequently designed his own typefaces. He did everything by hand. He never did anything electronically. His last project was designing the covers for my book, Jazz by Mail. Sure appreciate the graphic with LP covers and associated font styles. Reid is my fave designer, this helps me when I mimic his style for posters, etc. Thanks as always. “…a typophile site interested in the vintage fonts of the ’50s and ’60s…”. I’m glad you wrote that. My vinyl collecting habits suddenly seem mainstream.